I was looking for a new gambling game that I haven’t yet played. As a big fan of BlackJack, I was convinced that card games was something I was looking for. This is how I found Hi/Lo Switch – likely the most entertaining game out there. All my friends, who are far from gamblers and mostly aren’t even familiar with the rules of most games, love it. So what’s so exciting about it? As with most things in life, all the greatest things are actually really simple. This definitely applies to this game, as the concept used behind it is very simple. You won’t need any complex system, strategy or anything along those lines. However, you’ll need a fair bit of luck! Hi/Lo Switch is a game where players are required to predict whether the next card dealt will be lower or higher than the previous one. What does ”Switch” refer to? Well, after you’ve made a couple of correct guesses, you will be allowed to switch the cards dealt on the table. This is mostly done when 3 high cards are dealt and you are afraid to risk your initial winnings. So every time you want to play Hi/Lo Switch, you’ll be required to place a wager on the circled betting box, located on the right side from the three spots on whom cards are dealt. Once you have made your wager, hit the ”deal” button. This will lead to three cards beind dealt on the table layout and two buttons added to each of them, one on top and one on bottom of each card. Here’s the start of exciting part – you have to guess whether the next card will be lower or higher than one of the three cards dealt. Usually you’ll be presented with two options – ”Hi” and ”Low”. Quite obviously, these two refer to predictions that the card will be higher or lower respectively. The amount of money displayed at each button shows how much you can win, given that your guess is spot on. There’s also a third option that you can use – ”Switch”. Players are awarded with two opportunities to switch, with more coming after every 3 succesful predictions. If you choose to switch, three new cards will be dealt and no winnings deducted for using this option. Cards in Hi/Lo Switch are valued using the standard values, with a single exception – aces are the lowest ones. To make it easier for you to view, find a progression of cards, starting from the lowest and ending with the highest, below. Odds that are used to pay out are also heavily dependant on the likelihood of hitting either a lower or higher card. For example, if a queen has been dealt on the table, you can claim a huge payout by choosing the ”HI” option. Of course, with a king being the only victory card, the chances of this happening are slim. I’ve managed to spike a couple of them though, so it’s definitely possible. You can either go for the low risk of high one, when playing Hi/Lo Switch. That’s the only tip I can give you. I guarantee that you’ll have more fun than you’ve had playing any other gambling game. If you have limited funds, maybe you should apply low risk strategy of always hitting high probability cards and switching whenever needed. However, the main reason for gambling along with having fun is to have a shot at winning BIG. If you want that adrenaline pumping through your vens, you’ll have to take your chances! 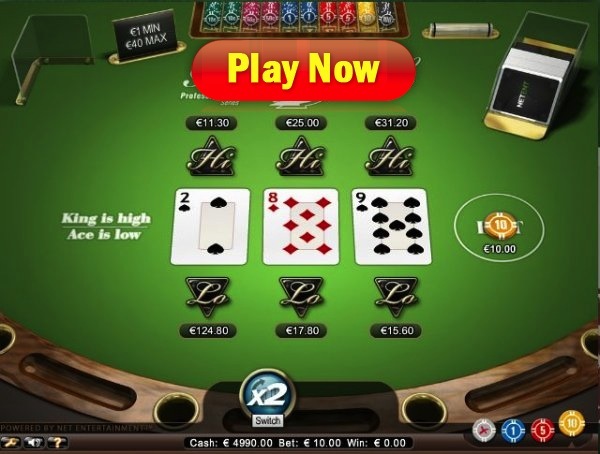 You have just learned how to play one of the most exciting casino card games out there. Note that while there are several casinos offering Hi/Lo games for real money, Net Entertainment are authors of the ”Switch” version. You can play this exact variation at Mr Green or Guts Casino! Both of these are respected brands in the industry and will generously treat you! CLICK HERE to join Mr Green!